The California Wine Club's By Reservation Program gives you access to the wines you want with no commitment and no obligation! For info call 1-800-777-4443 or email info@cawineclub.com. We wrap up the work week with an exceptionally appealing Washington State white and an updated revisit to a popular online forum poll. Juicy and fresh, pear and citrus flavors, gentle sweetness balanced by vibrant acidity all come together in an exceptional Chenin Blanc. Quickly told on a sizzling summer Friday, let's wrap up the work week with a look at an exceptionally appealing Washington State white and an online forum poll that revisits a question we last asked in 2001: "Would you share your wine with a fly?" We return to L'Ecole No. 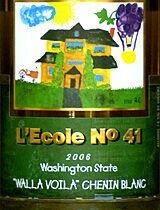 41, the excellent Washington State winery we visited a couple of weeks ago in "School's out," a report on L'Ecole's relatively affordable red blend, "Recess Red." This time the featured wine is a white, "Walla Voila," a gentle pun on Walla Walla, Wash., the trademarked label for L'Ecole's old-vines Chenin Blanc. The back label describes "Walla Voila" as "fresh and frivolous ... tart, lightly sweet and delightfully fruity Chenin Blanc from Willard Family Farms," created by the L'Ecole's founding wine maker Jean Ferguson and produced since 1987. I'm not sure about the "frivolous" part, which might imply a lack of seriousness; in fact, this white is seriously good. Cold-fermented and fresh, food-friendly at the table and interesting enough to enjoy on its own as a summer aperitif. The winery declares it Ferguson's version of Vouvray, and I could go along with that, based on its excellent balance of fruit, gentle sweetness and steely acidity over a rational 13.5 percent alcohol. Still, there's something about its body and luscious, forward fruit that says "New World" in the best sense. Worth seeking out, especially during the heat of summer; serve it chilled but not so mouth-numbingly cold that you'll dull its attractive complexities. Speaking of aperitifs and lazy, hazy summer days, 'tis the season when fruit flies, mosquitoes and gnats are most likely to wander into your glass. When this minor tragedy occurs, do you flick out the obstreperous invader and keep on sipping, or do you dump the glass and scrub it squeaky clean before pouring a refill? We asked this question five years ago in a Wine Advisor article and online forum poll, generating a lot of discussion. This week we're returning to the topic in another poll, this time with a twist: To check the hypothesis that men are more likely to ignore the creature, women more likely to reject the rest of the glass, we're inviting you to tell us your reaction, casting your ballot by gender. If you wish to vote - and I hope you will - it's necessary to register and log in. Registration is free and simple, requiring only that you register using your real name (or, as a minimum, first name and last initial). If you have difficulties, feel free to E-mail me for help at wine@wineloverspage.com . See you in the forum! FOOD MATCH: The slight sweetness of the wine works very well indeed with the reciprocal sweetness of fresh bay scallops seared in butter and finished with a dash of lemon and lime juices, served over linguine. VALUE: No complaints about a price in the middle teens for a wine of this quality, both food-friendly and enjoyable as a summer aperitif. Compare prices for best value in competitive markets, as the winery suggested price is just $12. WHEN TO DRINK: Ready to drink and made in a style for early consumption, but Chenin Blanc can be one of the most ageworthy of whites, so it wouldn't be a bad experiment in aging if you were to "lose" one under good cellar conditions for a few years.